Why Is Merkel Still So Popular? The chancellor looks like she's headed for a third term. Here's why Germans love her. BERLIN—Germans reaffirmed their faith in Chancellor Angela Merkel during the country’s elections today, with her supporting center-right Christian Democratic Union garnering 41.7 percent of the vote—8 percent more than in the last election—and setting up Merkel for a third four-year term. The scene at the CDU headquarters in Berlin, where supporters joyously drank and danced, was the final flourish in an election that had long been expected to go to Merkel, who Germans trust as much for her measured, competent personality as for the relatively prosperous economy she’s presided over. Television polls tonight showed that nearly 80 percent of all voters approve of Merkel, regardless of their political affiliation. 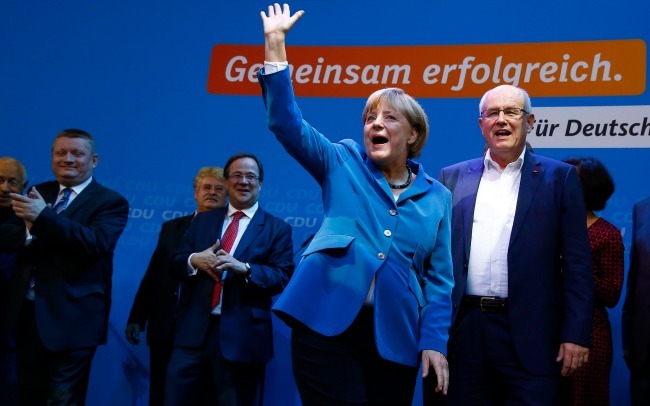 In Europe, Merkel has pursued a centrist, incremental approach to the euro crisis, and at home, she’s adopted many of her opponents’ policy positions into her own platform. Some have criticized the latter tendency as making it difficult for other contenders to emerge—or for voters to know what Merkel actually stands for. Her win also reflects Germans’ desire for continuity at a time when the country’s unemployment rate—5.3 percent—is the lowest it has been since reunification. Some attribute the healthy domestic picture to the chancellor’s seemingly non-ideological decision making, something her opponent decried as “sticking her finger in the air to see which way the wind blows” during a pre-election rally. Even events abroad have sparked about-faces for the chancellor: Her biggest recent policy—to abandon nuclear power in 10 years—was prompted by the Fukushima meltdown in Japan. This is in stark contrast to the steady hand of Merkel, whom Germans call “Mutti” (mother) with admiration. The fact that she’s the first chancellor from the former GDR has made her seem like an “East German Obama,” as one Social Democratic campaign strategist put it, and women tend to appreciate her even if they reject her right-leaning politics. In Germany’s complex parliamentary system, the winning party—in this case Merkel’s CDU—must either gain a majority of seats in the Bundestag or govern with a smaller coalition partner. Merkel’s former coalition partner, the libertarian-like FDP, lost big on Sunday and seemed like they might not even get enough votes to return to parliament, which means Merkel would likely form a coalition with her rivals, the left-leaning Social Democrats, or SPD. However, that coalition could take weeks to hammer out since the SPD have so far said they’d refuse to govern with the CDU. Some experts believe a “grand coalition” with the SPD would force Merkel and the CDU to be friendlier toward Southern Europe on bailouts, as the SPD favors both a more generous stimulus for struggling economies and stronger European integration. The country’s finance minister, Wolfgang Schauble, recently signaled that a third bailout for Greece will be necessary, but Germans are wary of “throwing more money at the situation,” as one voter put it to me, with no strings attached. Germany went through its own, tough social reforms 10 years ago, and its people now live with a comparatively less generous welfare state than other Europeans. At a campaign rally in Berlin on Saturday, Merkel came out strongly against eurobonds—a way for Germany to and other EU countries to loan money at better rates to their indebted neighbors—though she also called for strengthening the eurozone. "Mutualization of debt or sovereign bonds is the wrong approach ... There won't be any joint debt repayment funds and no eurobonds,” she said. But other experts here point out that a grand coalition would change little—the CDU and SPD don’t differ much on their approaches to foreign policy and the eurozone, and they voted together on most EU questions when they governed together in the past. What’s more, Germany’s economic miracle has, to some extent, come at the expense of stability in the labor market. It’s one of the few European countries without a minimum wage, and about a quarter of workers are low-wage workers toiling in so-called “mini jobs”—those without benefits or security. While the SPD has proposed establishing a country-wide minimum wage, Merkel prefers to leave it up to labor unions and employers to negotiate. Merkel’s supporters—and even her admirers in the opposition—seem to trust her to handle these challenges with her characteristic level-headedness. 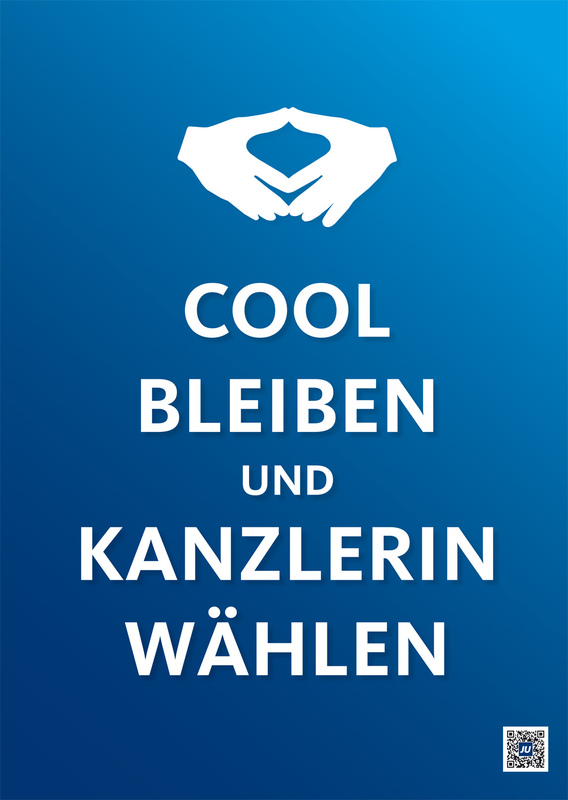 “Cool bleiben und Kanzlerin wählen,” they said—“Stay cool and choose the chancellor.” It’s adorned, naturally, with Merkel’s trademark finger-rhombus, a pose she said she strikes because it provides symmetry and improves one’s posture. “A lot of politicians don’t change their opinions because they think it might make them look bad,” said Janina Bilslei, a young CDU voter and a cashier at an accessories store. “But she does, because she thinks it’s in the best interest of the country."